UNIVERSITY PARK — Penn State students stormed the court as the buzzer sounded against No. 8 Ohio State and Mike Watkins shouted the familiar “We Are” chant into the announcers headset to a frenzied, white-out crowd. Even if just for one night, Penn State felt like a basketball school. “Life is all about memories and moments like that,” Tony Carr said. “It really reminded me of the endzone,” coach Patrick Chambers said, referring to the student section in Beaver Stadium. With NCAA tournament hopes on the line, the Lions’ topped the Buckeyes on Thursday night, 79-56, and extended their winning streak to four. The Buckeyes defense, which handled Big Ten competition all season, was helpless against the Lions’ offense. Carr led all scorers with 30 points. “That’s definitely a confidence booster when they can’t stop you,” Carr said. The hero on the defensive end was Josh Reaves, whose tenacious – and occasionally absurd – defense led the effort that frustrated and embarrassed the Buckeyes offense. Reaves recorded three steals, four rebounds and six assists, but his most notable contribution was the shuttering of Keita Bates-Diop, who leads the Big Ten with an average of 19.9 points per game. The forward finished with 10 points on 11 shots. Kaleb Wesson created early problems in the paint for the Lions. The forward scored the Buckeyes’ first four points.. But minutes later, Wesson was struggling to limp off of the court under his own power. The Lions took advantage of Wesson’s absence, scoring 12 unanswered points and sending the crowd into a frenzy, which happened often throughout the competition. Carr led the offense to a lead, but Reaves was responsible for the Lions’ early dominance. Bates-Diop missed his first three shots and didn’t score until well past the midpoint of the first half. The Lions outrebounded the Buckeyes 38-30. Watkins led the Lions’ interior effort with 10 rebounds. Wesson returned to the court midway through the first half, but the Buckeyes had fallen into a 24-10 deficit. For the first time all night, the Lions’ offense stalled. The Buckeyes narrowed the lead to nine as the Lions missed five shots. But the Lions took control again and capped off their strongest half of the season in the biggest game of the season in front of the rowdiest crowd to grace the Bryce Jordan Center in a long time on a 19-5 run. Everything was going right for the Lions. Even a last second heave to Carr under the rim resulted in an improbable and-1. Carr said they had prepared for that specific play, but the way it happened surprised even the star guard. “It never goes down like that,” Carr said. The Buckeyes trotted into the locker room with no momentum, 0-7 from the perimeter, 25-percent shooting from the field and their best player in Bates-Diop with only four points. The Lions went into the locker room with a 45-21 lead as a standing crowd applauded them. The Lions came out hot in the second half, growing their lead to 30. The momentum didn’t last long as the Lions fell into a drought. Over a five minute stretch, the Buckeyes’ went on a 14-3 run and cut the lead to 20. C.J. Jackson took the leading role, accounting for 11 of the Buckeyes points during their run. Helping the Buckeyes was the absence of Reaves, who was in foul trouble. Even with a 20-point buffer, the Lions looked like it was holding on for life in the final minutes. The urgency to make up for the loss of Reaves and hold onto their monstrous lead proved effective. The Buckeyes’ only two losses in Big Ten play have come to Penn State. The Lions will look to continue their momentum into their matchup at No. 6 Purdue. OHIO ST. (22-6): Tate 3-5 0-0 6, A.Wesson 1-3 1-1 3, K.Wesson 3-8 1-2 7, Bates-Diop 4-11 1-2 10, Jackson 5-11 2-2 13, Young 2-3 0-1 4, Potter 1-4 4-5 6, Jallow 1-4 3-4 5, Williams 1-4 0-0 2, Dakich 0-1 0-0 0. Totals 21-54 12-17 56. PENN ST. (19-9): Stevens 3-9 1-3 7, Watkins 4-7 3-4 11, Reaves 4-8 3-4 12, Garner 4-8 1-2 13, Carr 9-15 8-12 30, Hazle 0-0 0-0 0, Moore 0-0 0-0 0, Zemgulis 0-0 0-0 0, Pierce 0-0 0-0 0, Bostick 1-6 2-2 4, Wheeler 1-1 0-0 2. Totals 26-54 18-27 79. 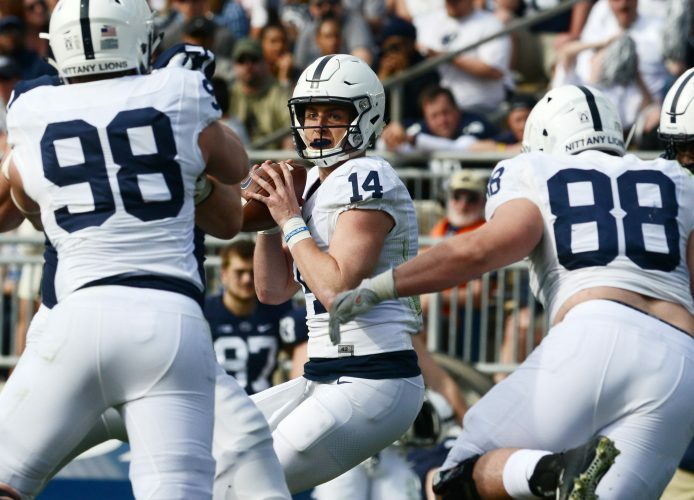 Halftime–Penn St. 45-21. 3-Point Goals–Ohio St. 2-15 (Bates-Diop 1-2, Jackson 1-5, A.Wesson 0-1, Tate 0-2, Jallow 0-2, Williams 0-3), Penn St. 9-20 (Garner 4-7, Carr 4-8, Reaves 1-1, Stevens 0-2, Bostick 0-2). Fouled Out–None. Rebounds–Ohio St. 29 (Potter 6), Penn St. 32 (Watkins 10). Assists–Ohio St. 9 (Tate, Bates-Diop, Dakich 2), Penn St. 14 (Reaves 6). Total Fouls–Ohio St. 21, Penn St. 19. Technicals–Ohio St. coach Chris Holtmann.